Deep Lines... Guide for Hire - ACMG certified guides based in Nelson BC. Josh Milligan - Devoted to professionalism and customer care, committed to ensuring a safe and enjoyable experience for your next mountain adventure. My passion for ski touring has led me to many remote destinations in Western Canada and Europe. Over the past 15 years I've consistently worked with a number of ski touring, snowcat and helicopter skiing operations throughout the mountain ranges of British Columbia. I've also had the opportunity to work as a mountain safety consultant on a variety of projects including; Olympic athletic training, industrial risk management and ski media production. I enjoy sharing my knowledge and would be pleased to help you plan your next adventure. Canada has a long tradition of professional mountain guiding. Beginning in the late 1800’s the Canadian Pacific Railway hired the first Swiss guides to lead mountaineers to the summits of unclimbed peaks in the Canadian Alps. The Association of Canadian Mountain Guides (ACMG) was formed in 1963 with the encouragement of Parks Canada. By 1966, a program for training and certifying guides was in place. In 1972, the ACMG became the first non-European member of the International Federation of Mountain Guides Associations (IFMGA), the international body that sets professional standards for mountain guides worldwide. ACMG guides are trained to provide experience-based decision-making in the field to balance two important facets of your trip – the feeling of adventure and your safety. The training and certification program requires 4 to 8 years to complete and includes the following instruction and assessment criteria; mountain hazard management, avalanche forecasting and prediction, advanced first aid certification and improvised rescue response. "I have had the pleasure to be guided by Josh for several trips to the BC backcountry. His ultimate concern is for the safety of my group. His ability to evaluate terrain and the abilities of group members are among his many strengths. I currently secure him as our guide a year in advance of our trip dates and will continue to do so." 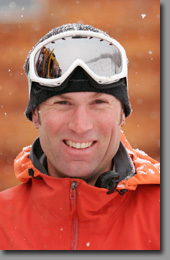 "Josh will always be my first choice as a backcountry ski guide! Josh was our ski guide for four amazing days of skiing last year and I attribute the great trip in large part to his abilities as a guide. Most importantly, Josh knew exactly how to pick the best runs for maximum powder and adventure, never complacent with skiing the same run twice. We skied harder and covered more terrain than anyone in the area, but were always completely safe. At the end of the day we were exhausted and exhilirated - the best combination there is!" "I had the pleasure of being guided by Josh this past winter. Josh has the perfect mix of making safety a priority yet allowing freedom for enjoyment of skiing. He is very knowledgeable about terrain, routes, and snow safety; has a calm demeanour, and is able to interpret his clients’ needs and comfort level. At the time of our ski trip, avalanche danger was high but Josh was able to safely lead us to some excellent and challenging skiing! I plan to use Josh as a guide for future backcountry trips and would highly recommend him to others." "For the past four years our group has had the pleasure of being guided by Josh Milligan in every condition imaginable. Josh has always exhibited a high degree of professionalism, patience and tact as he guided our groups on our three and four day trips. Josh is able to adjust the terrain and degree of difficulty to accommodate all of our groups (which include our family group trip in mid-December and our more aggressive groups in January & March)." "I've known Josh Milligan for about five years now. Have skied with him at Chatter Creek Glacier and at Farnham Glacier in British Columbia, Canada. Josh is an excellent guide. He is calm, cool, prepared, personable, trustworthy, experienced and skilled. I highly recommend Josh."